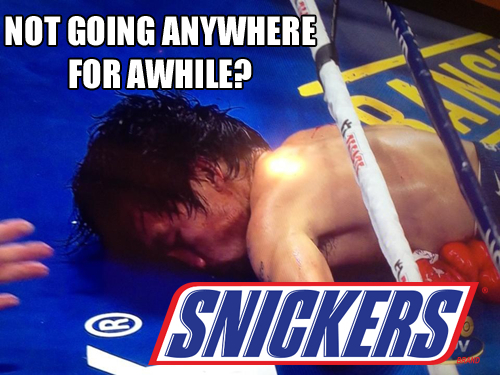 On Saturday night, if you stuck your head out your window just a few minutes after Juan Manuel Marquez knocked Manny Pacquiao out cold at the MGM Grand in Vegas, you might have heard a faint sound of clicking and clacking off in the distance. It was the sound of a million people jumping all over this story to create the world’s newest and (until something crazy happens tomorrow) hottest internet meme. 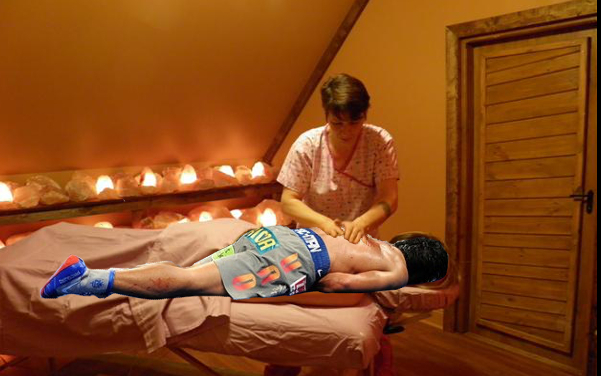 Twitter, Facebook, and Instagram lit up almost instantly with a ton of images featuring Manny Pacquiao lying unconscious in one place or another thanks to the wonders of photoshop. And of course, many of them were really funny. 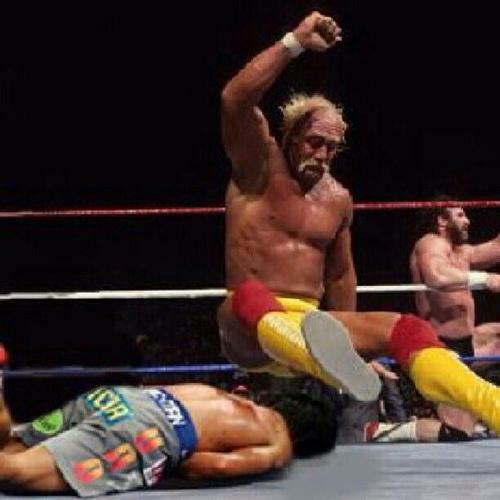 So for today we did a little digging and came up with what we thought were some of the best Manny Pacquiao knockout memes. Have a look and, hopefully, a laugh. 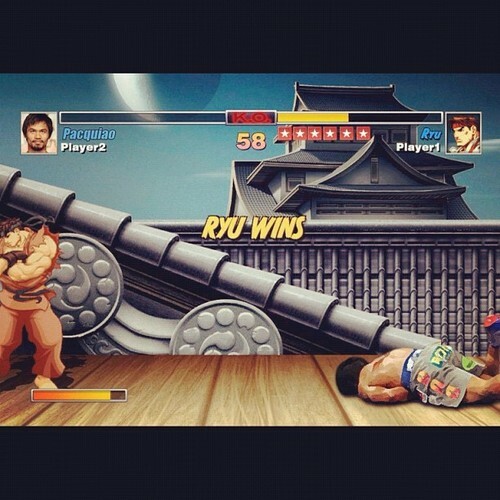 In fairness, Ryu is way out of Manny's weight class. That's how it always goes, isn't it? You're doing fine, but then you have one more Jaeger Bomb and it all goes to hell. 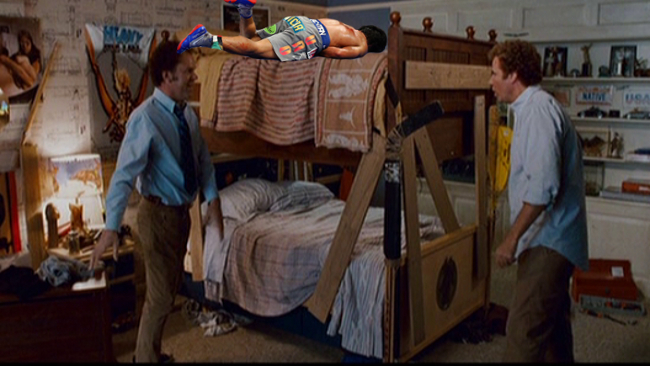 I guess Will Ferrell and John C. Reilly will be spooning tonight. 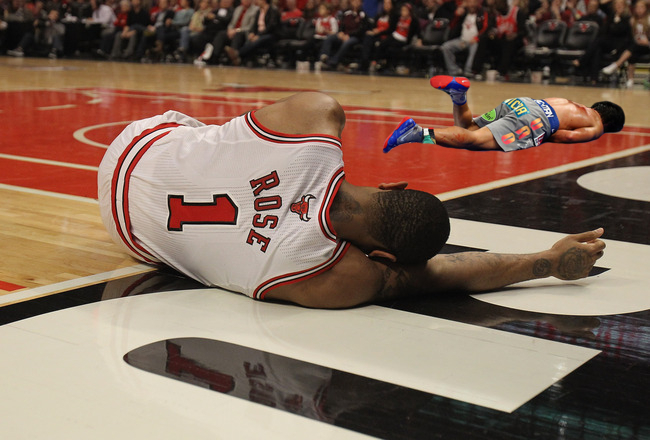 All this flopping in the NBA is just getting ridiculous. Get it? 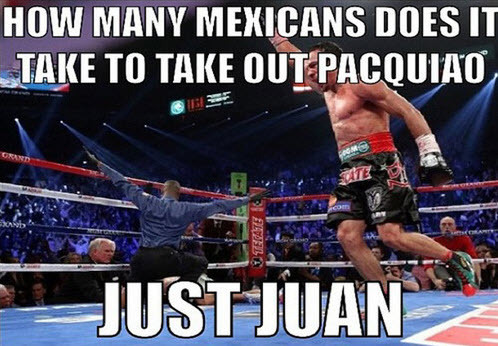 Juan? It sounds like one. And he's Mexican. Clever, right? 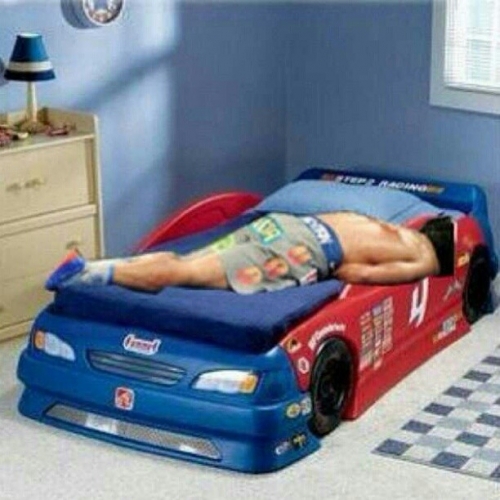 Quick survey: how long did it take you to notice Manny Pacquiao lying on the bed in the background? 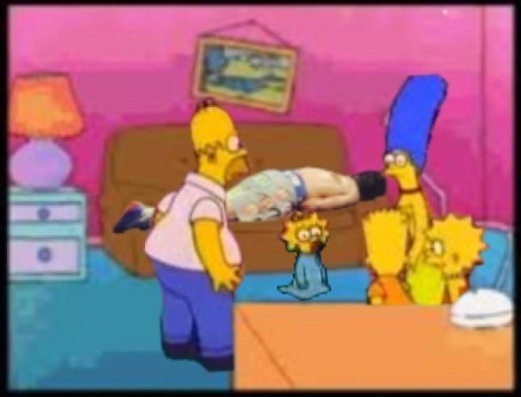 If this were real it would easily be one of the top 10 Simpsons couch gags of all time. It might even be the best—but I hesitate to make such a bold claim. 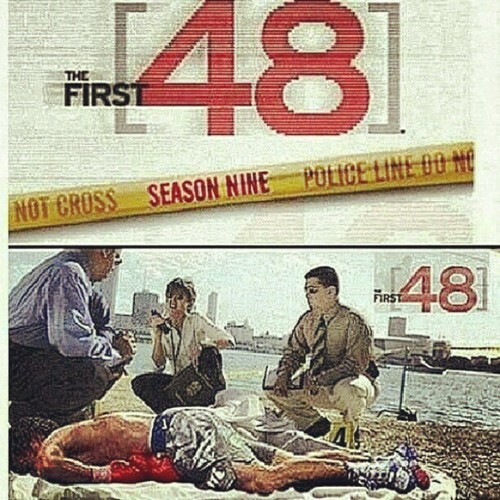 You don't normally have "cameos" on reality TV shows, but the producers of A&E's The First 48 made an exception for Manny. 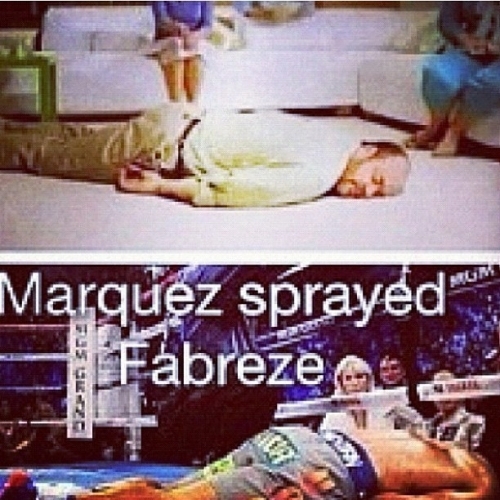 Hey, remember that Febreeze commercial where the guy gets down on the carpet to smell the carpet after the wavy fish odor lines have been chased off by Febreeze? Yeah, that was weird, but at least it resulted in this. 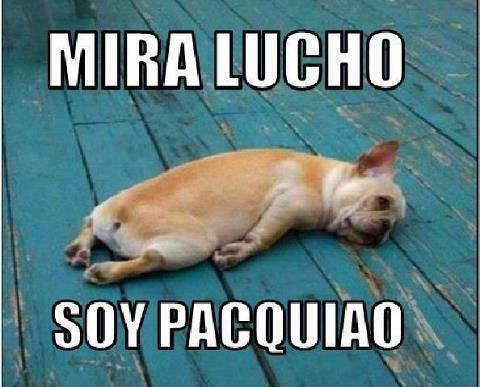 Awe, somebody punched that cute French bulldog in the face? That's terrible. 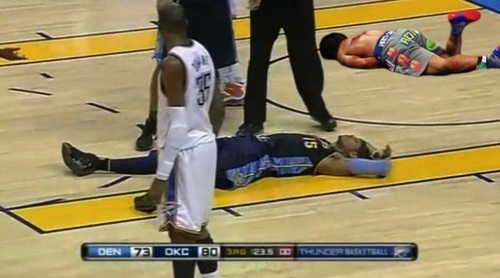 Forget planking. 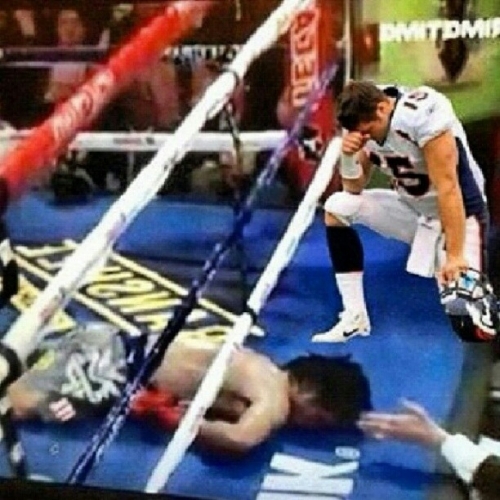 Forget Tebowing. 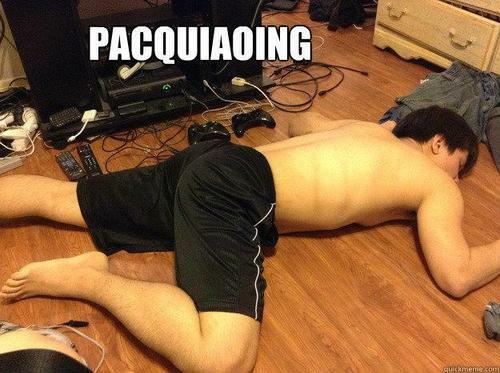 Pacquiaoing is the new thing (that your dad will discover in 3 months). 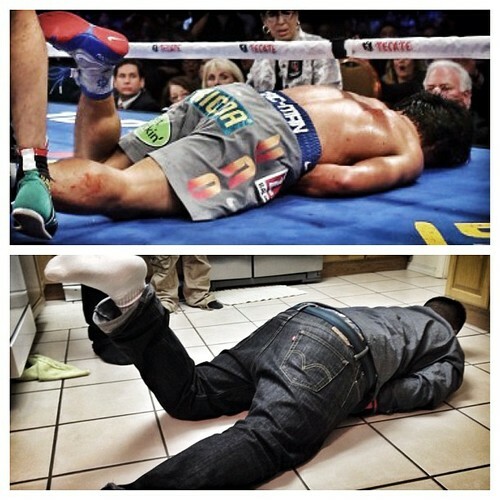 This guy nailed it, right down to the position of Manny's right arm. There's nothing like a deep tissue massage to melt the stress away. No towel? I hope the sand isn't too hot. 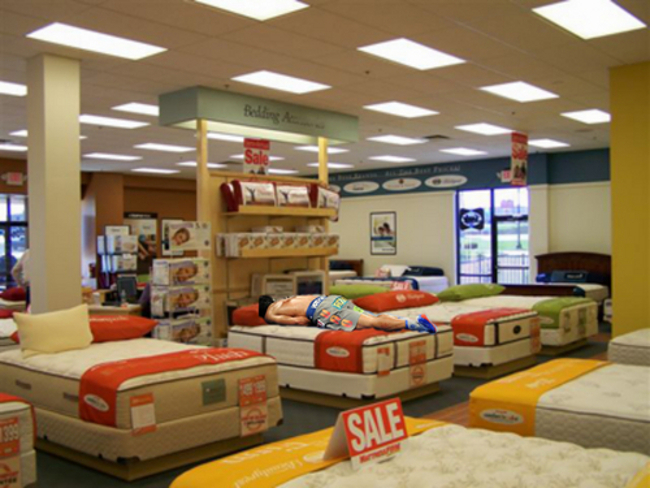 This is me every time I go into a furniture store. 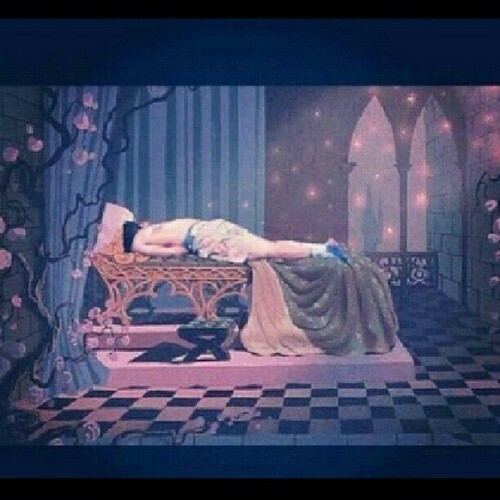 This is me at my uncle's house every Christmas Eve after a few too many scotches and sodas. 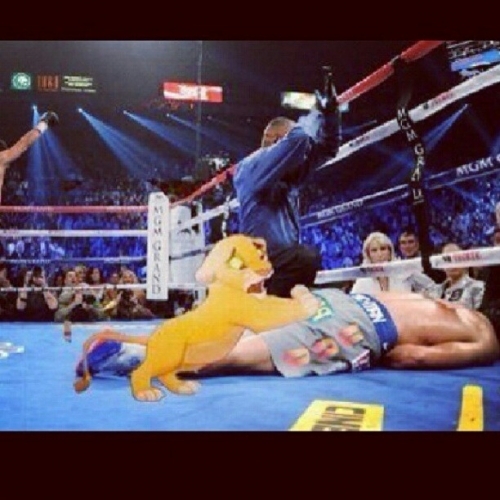 Manny's wife Jinkee knows how Simba feels. 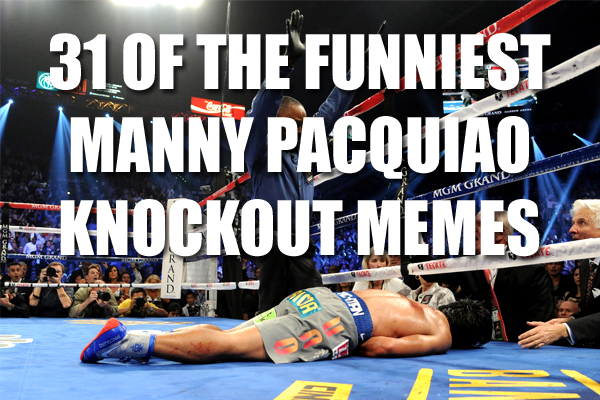 She was pretty hysterical after the knockout, and now she's saying she wants him to retire. 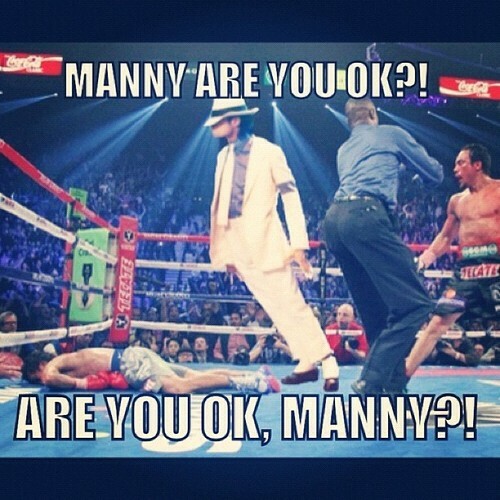 I saw what happened to Manny. What is Derrick's excuse? 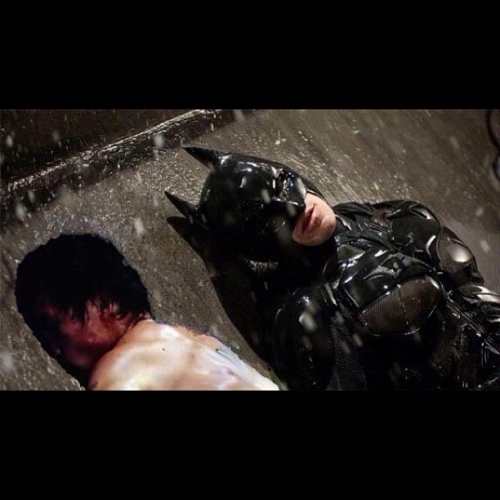 "I'm Batman...I said, I'm Batman...hello? Hey buddy, are you okay?" 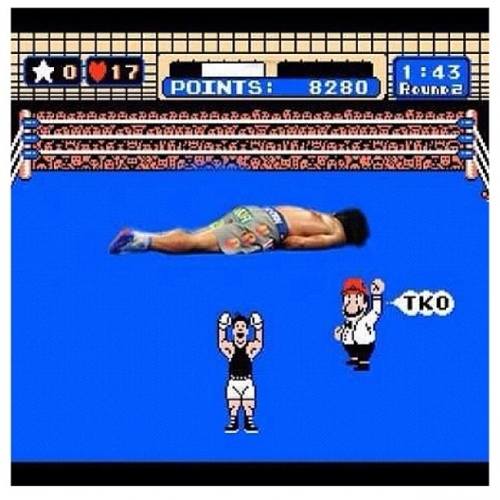 Just like in the classic Nintendo game Mike Tyson's Punch Out, Juan Manuel Marquez discovered that you just have to wait until Manny starts to punch, then punch him, and you'll knock him out. This is one of my personal favourites. 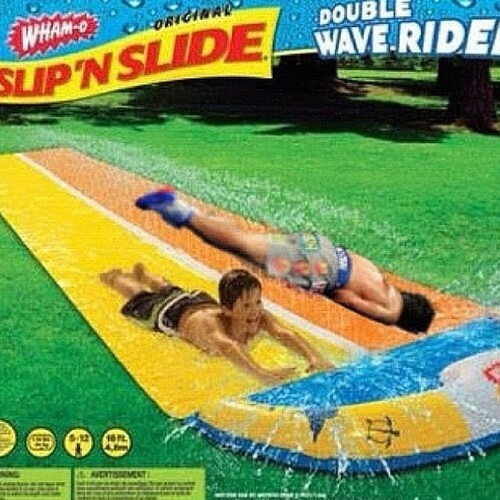 Even unconscious Manny Pacquiao loves a good Slip 'n Slide. 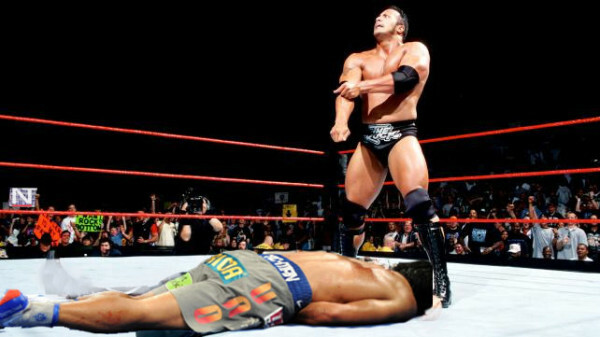 Manny smelled what The Rock, and it knocked him the f out. Hey, if you're going to have somebody praying for you, you could do worse than Tim Tebow. He got tackled by Betty White. 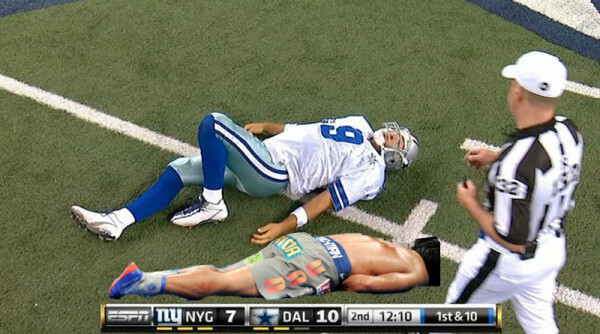 You know the internet has just been waiting for Manny to get knocked out so they could use this one. And yes, I do always refer to "the internet" as a single collaborative entity. 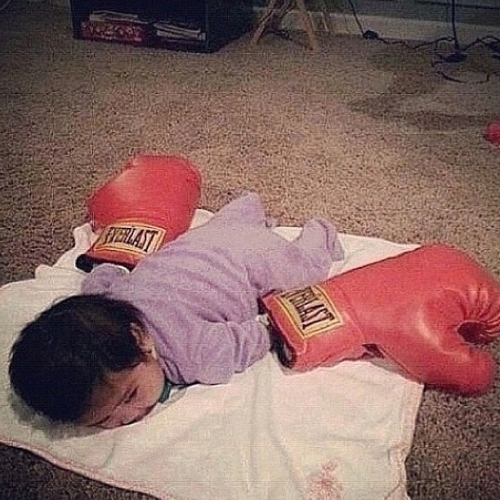 If I was Filipino and I had a baby, I would have done this too. It's absolutely brilliant. 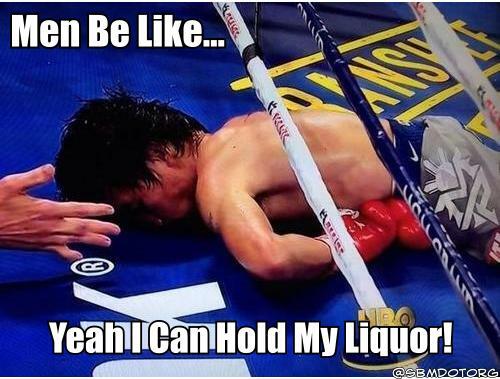 George Michael Bluth has this Pacquiaoing down. Critics always said Arrested Development was ahead of its time, but this is ridiculous.